Waterbury Clock Co. miniature iron cased clock, very rare, read on to hear why. A black label on the back says this is the "Posy". It is inan enameled cast iron case. Back is also cast iron. It is 8.5" high, 7" wide.It has about 80 percent of the medium green paint still intact. 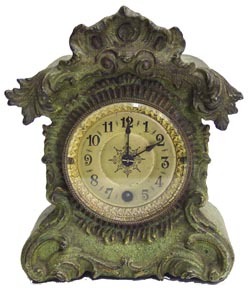 There is a 3" goldpainted dial with center designs, a great sash and beveled glass. The handsare no doubt original as is the rest of the clock. The movement is one daylever, running strong and striking a standing coil gong. It is most unusualin that a single mainspring powers both the time and strike. The mainspringis in a going barrel with gear teeth that power the time side and the windarbor also has a gear and click to power the strike side. It even has a racktype strike system. The nickel plated plates are solid and trapezoid in shape, and stamped Waterbury Clock Co. Nothing similar in any of the old catalogs.